Welcome back to another fashion post. In this weekly post, I share ideas and inspiration for kicking up your everyday style with real outfit ideas for real women. This week, we're talking white. White is the color of summer, but as fall begins, is it time to pack away the white until Memorial Day? There was an old fashion rule, no white after Labor Day. And while that may hold true for shoes (except for sneakers) and bags, as summer winds down, it's now perfectly acceptable to keep those white jeans, pants and shirts around. Around here this week, it's in the low 90s - AGAIN . . .the meteorologists are calling it a "real sizzler". That forecast has shorts and a t-shirt written all over it, no matter what month it is! I recently went all-white, celebrating the last bit of summer. Typically I don't match white and white, but I pulled out some pieces and gave it a try. I was happy with the results, this look won't work after Labor Day.Once Labor Day rolls around, we have to re-think our white pieces and make them a part of our stash of neutrals. While white is acceptable, you do have to give a nod to the weather and the calendar (unless you live in the south). It's like the girls you see wearing Uggs with shorts in June (aren't their feet hot??!). But pairing your white jeans with neutrals is very trendy for Fall. White jeans are also great with a black top. 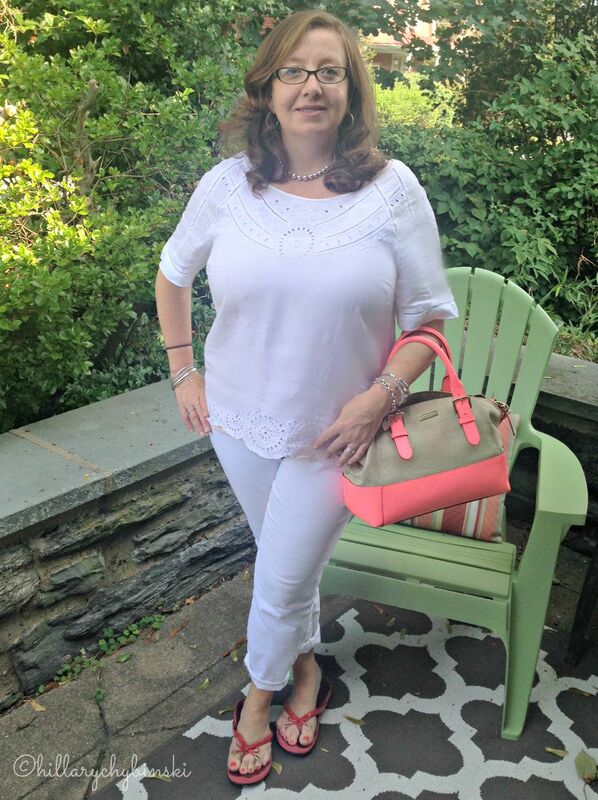 Pair your favorite white jeans with a pair of tan, grey or black booties - as the air starts to get cooler, maybe even a pair with a slingback or open-toe. As long as the weather says "bootie" and not "flip-flop" you're ok. So let the weather be your guide, which may mean summer-ish clothes until October, even though I am MORE than ready for cardigans and booties. And if you are looking to add to your fall wardrobe right now, I'm seeing lots of plaid, booties and hats. Yes - felt and wool hats are making a comeback - hooray! 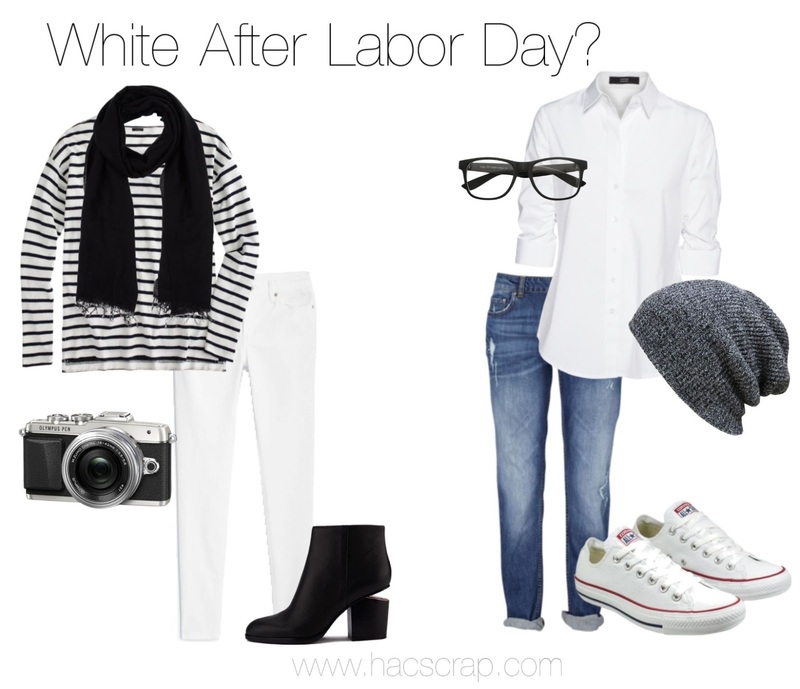 And YES - you CAN wear white after Labor Day - so let's get to it! What are you wearing as summer fades to fall? This post is linked up at The Pleated Poppy. Check it out for even more outfit ideas and inspiration. Great tips - makes sense, even to me who lacks all fashion sense!! Your top is very pretty - great cur-our details! Yes, I wear my white jeans and tees year round. And some of my white shoes... Very nice monochromatic look, Hillary! I love the look of white jeans, but with three little boys I am not brave enough to wear them!